So I was never very interested in the stress of photographing a wedding. It would just be too much! I am not built for that type of pressure. The idea that I would sneeze and miss the first look- yep, not going to do it. A couple moths ago I had a call. A young woman began to tell me that she was married the year before and her photographer had had something happen and she was not getting any portraits. All they had was cell phone pictures from their wedding day. Mistakes happen, and unfortunately this photographer made a mistake with this couple. They were hoping for portraits in their wedding attire. And so it was arranged! And this excited me! As it is always fun to get out of the box you place yourself and have some fun! Here is their beautiful bridal session- it will never quite be as special as portraits from their actual wedding day- but I hope that they provide that documentary of how they looked and loved to joined together in matrimony! They started their session in what would be considered a couple session. 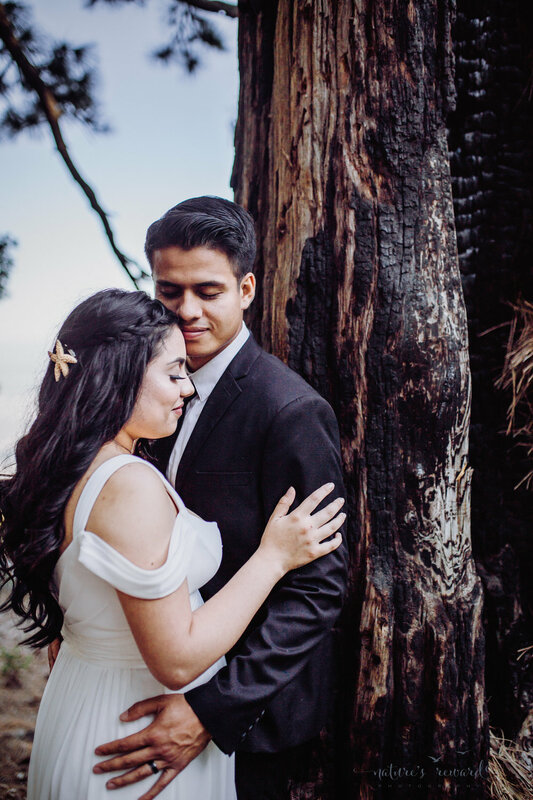 Gorgeous couple session in Lake Arrowhead Ca. featuring a floral summer dress and a long sleeves and pants in this beautiful portrait by San Bernardino photographer Nature's Reward Photography. The bride in her best, "come Hither" a portrait by Nature's Reward Photography. Gorgeous bride in an off the shoulder wedding gown in this bridal session by Nature's Reward Photography. I am over the moon in love with these portraits! And I am looking forward to booking more couple sessions, engagement sessions, and bridal sessions like this one! Thank you to the lovely couple for choosing my artwork to create these portraits to remember their vows forever!